Motherwell have said they are undecided on how they would vote should a "newco" Rangers apply to join the Scottish Premier League. A club statement stated they cannot separate "sporting integrity" from plans for a sustainable future. However, the Lanarkshire club have said they will discuss the issue with fans, should a vote arise. 'Well finished third in the SPL and qualified for Champions League football due to Rangers' European ban. We do not believe we can separate the sporting integrity of our league from the sustainable future of our club; the two go hand in hand. "In the event that a 'newco' proposal is presented to us, we intend to fully discuss with representatives of our supporters groups, prior to making any decision," said the statement. "The club continues to actively participate in the discussions being held at the SPL in relation to the current issues at Rangers Football Club. "To date we have seen no proposals to transfer a share in the SPL to a 'newco' and have therefore made no decision on how we would vote if such a scenario did arise. The 12 SPL clubs are meeting on 30 May to discuss the issue, although the prospective owners of Rangers hope to reach an agreement with creditors. And the statement acknoweledges the uncertainty surrounding the future of the Ibrox club. "We have purposefully avoided making any public statements to date given the uncertainty of the situation and the lack of any clarity on what, if anything, we will be required to vote on. "Once we have full information we will be able to decide our position. "We are well progressed with a plan that is designed to bring both fan ownership and long-term financial stability to the club, without reliance on funding from either a bank or a benefactor. "We do not believe we can separate the sporting integrity of our league from the sustainable future of our club; the two go hand in hand." Aberdeen and Celtic have both issued statements that they would act in the best interests of their club and Scottish football. Hibernian chairman Rod Petrie last week said that "sporting integrity is beyond purchase", while St Johnstone chairman Steve Brown insisted he would vote for sanctions against a "newco" Rangers. 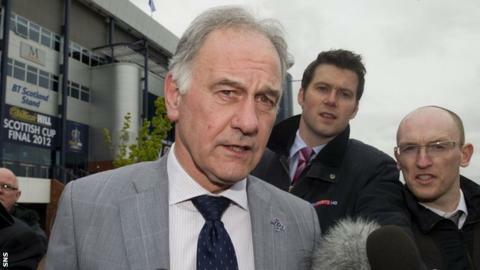 However, Kilmarnock chairman Michael Johnston has argued that there should be no increase to Rangers' current punishment of a 10-point deduction and 12-month transfer embargo.